Get rid of that old, outdated bathtub with a new bath system from See-Thru. We have a wide variety of styles, colors and patterns that allow us to easily transform your bathroom in as little as one day! Our replacement bathtubs are designed to go into your existing tub space, so you don’t have to worry about the hassle and mess of changing the structure of your bathroom. See-Thru bath systems are made with some of the strongest materials that won’t peel, crack or fade, so they can look great for years to come. If your bathtub is the problem, you can get a beautiful, long-lasting replacement bathtub that comes in a variety of colors and patterns. If you’re tired of cleaning your dingy shower, our wall surrounds are the solution to your problem. Our high-quality acrylic is non-porous and easy to clean. 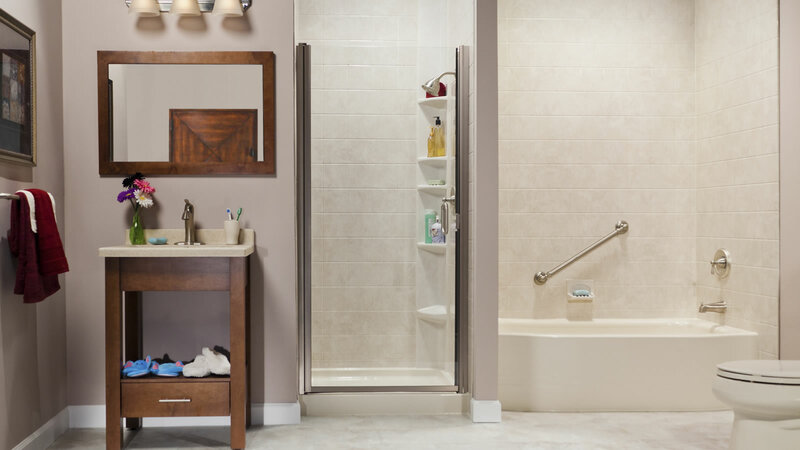 Our job at See-Thru is to give homeowners like you a complete bathroom remodeling solution that fits your personal style and budget. When you choose See-Thru, you’ll end up with a beautiful, easy-to-clean bathroom that will increase the resale value of your Bowie, Gaithersburg, or Rockville home. We use some of the highest quality materials available and our installers are expertly trained so you can feel confident when you choose See-Thru. Homeowners in Arlington, Lexington Park, Annapolis, and throughout Maryland and Northern Virginia contact us today and one of our professional installers can help you determine the perfect bath options for your home. You can also check out our other bathroom remodeling styles like shower bases and tub-to-shower conversions.